Home kabar alam Does Indonesia Govt Protect Illegal Land Clearing? Does Indonesia Govt Protect Illegal Land Clearing? JAKARTA, KOMPAS.com — An environmental group has released video footage of a bulldozer buzzing trees in a protected forest that is home to endangered Sumatran tigers, but the government said Wednesday it remained unclear if the land-clearing was illegal. Another image showed one of the majestic cats walking through what is now a barren, muddy landscape. 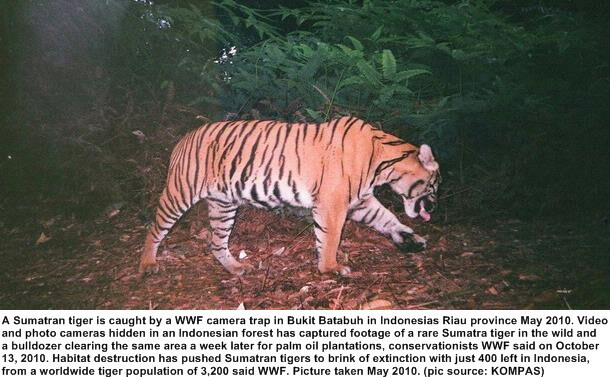 Ian Kosasih, a director at WWF-Indonesia, said the camera trap was installed last year in a plush corner of Bukit Batabuh, a forest in Riau province that is protected from commercial exploitation, so experts could study tiger populations and the threats they face. There are only around 3,200 tigers left in the wild worldwide. But the Sumatran tiger, which today numbers at around 400, is the most endangered subspecies, largely because of illegal poaching and the destruction of their habitat for palm oil and wood pulp plantations. Bukit Batabuh is considered crucial for conservation, because it acts as a corridor between two national parks. Though the images were captured in June, they were only recovered and brought back to the capital, Jakarta, this week. A nighttime shot from May also showed a male tiger spotting the camera, sniffing it, and then walking away. A mother and two cubs were filmed months earlier by another video trap 200 yards (meters) away. Foresty Ministry officials said they knew about the footage and were investigating. But it was too early to say if the bulldozing activities were illegal because, while protected from commercial development, with the right permits local officials could authorize road-building, said Darori, a director general.